how we relate to ‘nature’ and its role in our everyday lives. We will also illustrate how some consider burying the remains of a beloved animal in a ‘whole-family burial plot’ as a beautiful conclusion to earthly life, while others might sadly regard such a practice as an offense. We are the first generation to behold the Internet and experience the many ways it alters our world and lives. In just a couple of decades, privacy has become an increasingly rare phenomenon. A few have shared extremely private matters of the heart – their experiences with natural burial. We thank them for their courage and vision in sharing these stories with the rest of us. Below are stories of pet burials as well as those about animals who would not fall into the category ‘pet’. We will post an exploration of the term ‘pet’ in the future, but for now – in this section – we include stories of time-honored tributes to animals who were loved, respected, and considered either family or friend. Rwanda. Famed primatologist, Dian Fossey, filmed a moving burial of the remains of her beloved friend, Digit. A young silverback mountain gorilla, Digit was killed by poachers on the last day of 1977 while defending himself and the other 13 members of his family who subsequently were able to escape. During the night of December 26, 1985, Fossey, too, was murdered; her remains were laid to rest beside Digit’s grave in the burial ground she established behind her cabin at her Karisoke Research Center (now cared for by the Dian Fossey Gorilla Fund International). [Spoiler Alert] In the final scene of the 1988 film, Gorillas in the Mist, Fossey’s tracker and companion, Sembagare, is shown arranging rocks around Digit’s and Fossey’s graves in such a way as to unite them in a single family plot. The International Primate Protection League published a special edition of its April 1986 newsletter, with remembrances of and tributes to Fossey from around the world. Read about Evelyn Gallardo, the woman who designed Fossey’s headstone. Take a virtual tour of Africa’s Virunga Volcanoes with famed conservationist, Ian Redmond, and visit the graves of Fossey, Digit and the gorillas (www.vEcotourism.org). Read poetry referencing gorillas and Fossey at the Ape Alliance. Rwanda. A more recent gorilla burial (September 2009) has been documented by the Dian Fossey Gorilla Fund International. Karisoke staff and researchers provide a loving burial for Titus in the same burial ground where Dian Fossey rests. Cameroon. 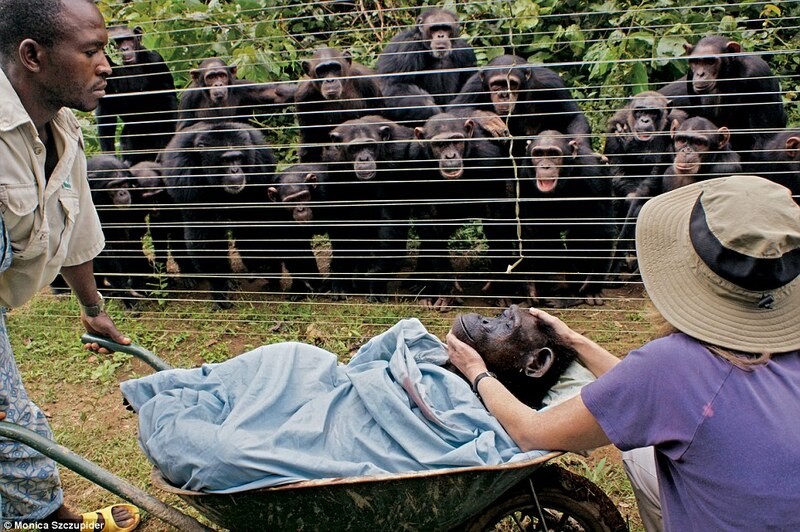 “More than a dozen grief-stricken chimpanzees joined in an extraordinary expression of mourning as an elder in their family was laid to rest at a West African animal sanctuary” NY Post. A follow-up story provides the details of Dorothy’s captivity and deliverance to the Sanaga-Young Chimpanzee Rescue Center. The original story was presented by National Geographic (10/09). Higgins and Frank Inn © Kathleen Copson. Elias Franklin Freeman (a.k.a. Frank Inn) was a celebrated animal trainer for Hollywood films and TV. Among the most famous of his animals was Higgins, the dog who played Benji. According to Wikipedia, he said that he and his helpers had over 1,000 animals under their care. There was one animal who, as legend would have it, was most dear – Higgins. Inn’s daughter had said that he made plans for his funeral before his death, which included a special made coffin with pockets for the cremains of all his former pets, including Higgins. Unfortunately, the cemetery told the family that, upon Inn’s death in 2002, they could not honor those plans due to the interpretation of the CA cemetery law. We are trying to obtain more information about this story – but it illustrates the need to modify laws to allow for Whole-Family Cemeteries. Barney was an independent cat who made his home at the St. Sampson’s Parish Church cemetery on the island of Guernsey off the coast of England. After his family who lived next door moved a mile away, he kept returning to the cemetery where he comforted mourners during funeral services and visits for 20 years. Since Barney passed on, he was laid to rest in a special place within the cemetery. But the greatest tribute will be in recognizing cemeteries as places that provide comfort and healing to animals of all kind – human and nonhuman. For more information, read here. The Rose Garden at the FDR Presidential Library is the burial site of Franklin and Eleanor Roosevelt. Two family dogs, Fala, FDR’s constant companion, and a German shepherd named Chief (1918-1933) who belonged to their daughter Anna, are buried near the sundial in the Rose Garden. While the quote says ‘not far’ the graves are about five yards away (about four and a half meters). Visit our webpage on religious practices and animal burial.